Why do your patients simply stop coming to see you? It’s a question that has many answers. It’s easy to point to the many reasons why patients stop scheduling appointments, but what may not always be as easy to do is figure out a strategy that will dramatically minimize the number of patients you lose. 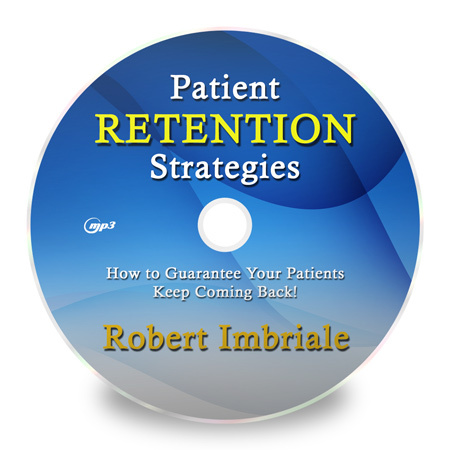 I’ve just created an all-new audio training program that will show you how to limit patient attrition! The better news is that you can get this program FREE! This program is normally sold for $97, but it’s yours free just for the asking! You’ll discover the core reasons why patients leave and you’ll hear some powerful strategies for correcting this trend in your practice. Get it now by entering your contact information on the form to your right. Robert Imbriale is a powerful speaker, best-selling author, and career marketing expert. He is also highly passionate about natural health and healing and it is past of his personal mission in life to help spread the message that there are other choices besides drugs to cure many of today’s most challenging health issues. His book, Motivational Marketing became an instant marketing classic and has gone on to change the way thousands of businesses market themselves. Robert is the founder and CEO or Ultimate Wealth, Inc.